NOW TIL SATURDAY 2/8/19 SHOP RITE HAS COLGATE OPTIC WHITE TOOTHPASTE ON SALE FOR $2.99 EACH. 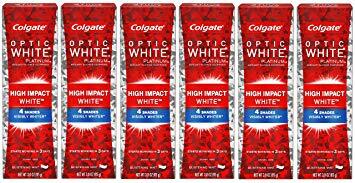 BUY 2 COLGATE OPTIC TOOTHPASTE FOR $2.99 USE (1) $4/2 DIGITAL AND (1) $4/2 COUPON HERE PAY $0.00 OOP.. IF YOUR STORE ALLOW OVERAGE THERE WILL BE $2.02 IN OVERAGE!1 HAVE SOMETHING IN THE CART TO APPLY THE OVERAGE TO!! ← SCORE UP TO 3 ARM AND HAMMER DETERGENT PRODUCTS FREE!! !